Basement flooding is a nightmare for any homeowner. Aside from making your basement unusable, a basement flood can ruin your personal belongings and create a serious health and safety hazard. If you have water in your basement, you need answers: what caused the flood and how can you stop it from happening again? Any basement can flood. 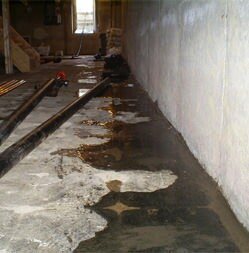 Waterproofing your basement now can protect from future flooding. This could be a burst or leaking pipe, a leaking waste line, a broken supply hose for your washing machine, or a leaking water tank or water heater. If your window wells fill with water (from a flooded yard or clogged gutters), don’t be surprised if water leaks into the basement through and around the windows. This is by far the most common cause of basement flooding. Excessive amounts of rain, poor yard drainage and sewer backups are common culprits behind a leaky foundation. Fortunately, it’s a problem that Basement Systems can solve by installing a warrantied, industry-leading waterproofing system. We recommend following these steps to return your home to its pre-flood condition and protect the space against future flooding. Don't risk serious injury if your basement floods. A flooded basement can be a serious health and safety risk. If your basement floods, follow these rules to make sure your family stays safe. Avoid venturing down into the basement if possible. In a severe basement flooding situation (water covering the basement floor to a depth of an inch or more), it’s best to stay out of the basement until the water is pumped out. Standing water in your basement can contain harmful bacteria. Never touch electrical wiring or fixtures. If you must venture down into a flooded basement, wear waterproof rubber boots. Avoid touching or using electrical devices (except for a battery-powered flashlight) because this puts you at risk of electrical shock or electrocution. Have standing water pumped out as soon as possible. Your local Basement Systems dealer can recommend a professional who will pump standing water out of your basement, and possibly help you deal with water-damaged items and materials as well. Sometimes the source of unwanted water is obvious –as with a burst water line, for example. In other cases, water may be leaking into your basement in different areas. After the water has been pumped out of your basement, contact an expert at Basement Systems for a free waterproofing inspection and estimate. Your Basement Systems technician will explain what causes basement water problems, and how a waterproofing system works to keep your basement dry. Are there wood-framed walls finished with drywall in your basement? If so, the lower section of these walls is likely to retain moisture and attract mold –even without a major basement flood. Talk to your Basement Systems expert about our innovative EverLast™ half-wall replacement system, which enables you to replace only the moisture-damaged and mold-prone lower wall section with an attractive and waterproof wainscot treatment. Basement Systems' basement waterproofing products, such as our patented perimeter drainage systems and sump pumps, provide the most effective basement waterproofing system available. Our sump pumps are designed to handle major water volume and we have battery backup systems available to keep your basement dry during a power outage. Even a single basement flooding experience is one too many. To avoid such a disaster, contact your local Basement Systems contractor today schedule a consultation and get a cost estimate on waterproofing your basement.